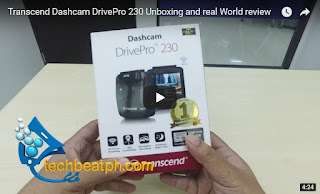 Techbeatph.com recently reviewed the Transcend Dashcam Drive Pro 230 for safety driving in the Philippines. The Transcend Drive Pro 230 gave us full HD images and was great in both day and night driving situations. The dash cam provides utmost clarity and resolution for the safety of the drivers and the passengers of the vehicle. The Transcend Dashcam Drive Pro 130 is an awesome camera watch the Video to see what we think of it.